Heeft u een vraag voor The River Hotel? Of u nu een toerist bent of zakelijk reiziger, The River Hotel is een uitstekende accommodatie tijdens een bezoek aan Nakhon Phanom. Het hotel ligt slechts 3 km van het stadscentrum: lokale bezienswaardigheden zijn dus snel te bereiken. Dankzij de praktische locatie liggen alle belangrijke trekpleisters in de buurt van het hotel. The River Hotel biedt een onberispelijke service en alle essentiële voorzieningen om vermoeide reizigers een verkwikkend verblijf te bieden. De accommodatie heeft een uitgebreid aanbod aan services, inclusief gratis wi-fi in alle kamers, 24-uur receptie, bagageopslag, wi-fi in openbare ruimtes, parkeerplaats. Gasten kunnen kiezen uit 72 kamers, welke stuk voor stuk plezierig en comfortabel zijn ingericht. De accommodatie biedt geweldige recreatiemogelijkheden die uw verblijf onvergetelijk zullen maken, zoals wellnessfaciliteiten, massage, tuin, karaoke. Als u op zoek bent naar een accommodatie die comfort en gemak in Nakhon Phanom biedt, dan is The River Hotel uw thuis ver weg van huis. Hoewel het hotel een eind buiten de stad ligt, heb je een fantastisch uitzicht op de Mekong en de bergen in Laos. Boek dan wel een wat duurdere maar betaalbare kamer op de hogere etages. Het bed is goed, maar de muren zijn zo dun dat het lijkt of de televisie bij je buren op jouw kamer aan staat. Dat is vooral vervelend omdat Thai vaak al om 5 uur in de morgen de tv aan zetten. We hebben heerlijk a la carte gegeten in het restaurant. Mooie, schone kamer en badkamer. Vriendelijke staf, leuk buitenterras aan de rivier. Prachtig uitzicht op Laos. Modern nieuw hotel. De kamer was groot en goed ingericht en de badkamer groot met een geweldige douche. De ligging aan de Mekong is mooi. Het verblijf was aangenaam. Het personeel was vriendelijk. We konden gebruik maken van de service van het hotel om met een golfwagentje naar een restaurant te worden gebracht en opgehaald. De bar was gezellig met life muziek en het ontbijt goed. De ligging is weliswaar buiten het centrum, maar goed ten opzichte van de verbindingswegen. Zeker een aanrader. This hotel is really nice and clean. If you want to stay at the quiet place, here is the place for you. It's a bit far from city center not in walkable distance but they do have shuttle service to city center and airport. No swimming pool and fitness but they have spa. I had a pleasant stay. Comment on other people's review Maelyn Singapore review on 13/01/19 Is right that there is a construction that did spoil the overall river view . But it's not only for The River Hotel. I'm currently staying 1 night 09/01/19 to 10/01/19 at the New FORTUNE RIVER VIEW HOTEL It's a whole stretch along all the way where all the Hotels are! The construction is even all the way to the weekly weekend night market area. And if i were to compare it's definitely worth it to spend more on The River Hotel than Fortune River View Hotel. 2nd comment on other's review James United kingdom review on 8th March 2018 100% agree with u! Million dollar sunrise from bed! Lastly my own review. Have one of the most friendly and helpful staff.. thank u all for making my stay wonderful. Breakfast variety was not alot but they serve delicious local noodles which gives it a very authentic Nakon phanom feeling. Night time bar was good with live bands too. Mainly full house on weekend with locals staying around the corner as the food they serve is good. Lastly lastly bed was comfy no dirty stains on bed sheet or towers..air con was cold..hot bath was working well...tv signal wifi was all working well. Stayed in room 555. Hard to find fault with the hotel really..... Lovely room with views over the Mekhong river and Laos. Nice restaurant with good food and live music. Friendly and obliging staff. Quiet and relaxing. Maybe the only improvement,I can suggest,is if they had a swimming pool. Clean room and good view to the Mekhong River. Great River view in every room. Extremely clean, quiet, good bed, good air conditioning. It’s really a good place to rest. But there is no gym or pool. And getting to the city is about 4-5 km away. Breakfast is not that accommodating if you don’t eat pork. However a staff made me a personal dish since I had no options. The River is a very well kept hotel that has an understated exterior. Each room has the same indiscriminate angle of the Mekong River. Our friend stayed in a river view room and we in a paradise suite. We were all very satisfied with our rooms. Housekeeping was timely and thorough and very sweet (at least on the fourth floor). The staff were generally nice, capable of speaking Thai, Lao and English. But other than check in and out, we didn’t really had much contact. Breakfast offered a fresh selection of salad and fruit, with an egg station and noodles/porridge station. But if that’s not your typical breakfast, there is a nice bakery about 250meters north of the hotel. 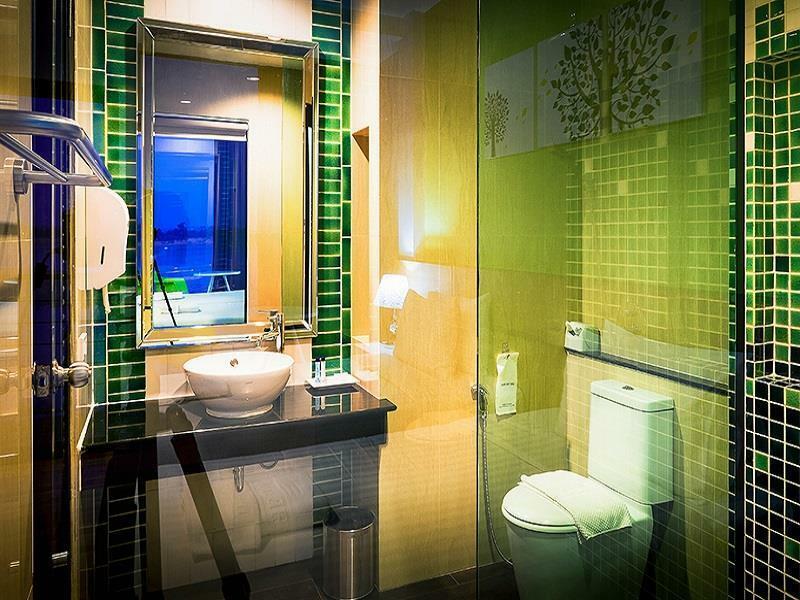 Nice rooms, great bathrooms, Ok breakfast. But it is all about the VIEW. The rooms have huge Windows facing out over the Mekong. Watching the sunrise from bed is special. I booked for one night and stayed for three. I stayed 2 nights this hotel.The hotel closed Mekong river it beautiful place.Breakfast is hotel many choose.Recommend fried egg pan it a delicious.I will go back again. Two suggestions for improvement: - the TV signal is bad. Nice to be able to watch TV as the location is very quiet. - service of almost all hotel staffs is not up to the standard. They are not friendly and not helpful. Overall, it’s a very nice hotel. Definitely will stay here again. Watch the Mekong flow by. Good size clean rooms. Helpful staff gave me a desk to do computer work each day. Restaurant is decent and breakfast is good - especially the eggs - though real coffee would be better. A pool or gym would make this perfect but I guess the rates would be higher. Only negative was the boat cruise being cancelled - perhaps because only two customers? Otherwise very pleasant stay and seems always full so book early. Comfortable room with a great river view. Nice breakfast. Kind staffs (especially the guy in the day shift). Only one downside for us, the hotel transportation fee to downtown is a little expensive. To rent a car or motobike is the best idea to travel around. Anyway, good hotel. Recommend. - clean room and all around the hotel. - great Khong river view. - nice staffs. - a bit far from town but they services mini van / or you can rent a car at the counter. - coffee shop is also nice view the view and its taste. Thoroughly enjoyed our stay at The River. All rooms are tastefully furnished and have a wonderful river view into the hills of Laos -- A/C took a while to cool down the room but they sent us a complimentary bucket of ice for our drinks since the fridge had been unplugged and took a while to cool things down. For 100 Baht we got a sunset riverboat tour of almost 2 hours up through town and along the Laos shoreline. We had dinner at the Riverside restaurant and had a great meal with drinks for about 1000 Baht right on the river edge with superb service. Would stay here again in a heartbeat. It was our first time to this province and this area. With the great help of staff, our trip was splendid! RECOMMENDED, book the 1 bedroom suite, it is very worth your money, huge clean room, best view you can ever get right from your bedroom. Only 2 things is that the TV doesn't have clear signal and poor wifi, but that is great as it give us time to do other stuffs.